Easy Snickers Ice Cream bars that are dairy-free, gluten-free and free of refined sugar. This recipe makes healthy snickers ice-cream bars with pure ingredients that leave you feeling good. The bars may take a few hours to make, but the freezer is doing all the work in this simple recipe. Vegan, paleo, and therefore suitable for a whole foods plant-based diet! The high-fat content of the coconut milk and the cashew nuts with the aeration of blending means no churning is needed. They are soft like you would expect from an ice cream bar. Watch the snickers ice cream bars video recipe to see the consistency! Almond butter was used but peanut butter would work just as well. I prefer crunchy nut butter in this to add texture. If you don’t have any nut butter then grind some nuts and stir in a sweetener. The cashews are soaked in order to make them easier to blend, an hours soaking in water is enough to soften up. It’s best to line your tin with a non-stick sheet or use a flexible silicone tray so the mixture pops out easily. It does get a tad messy cutting up the snickers ice cream bars from the block. Then even messier when coating with a thick layer chocolate, but it’s really fun! If you would rather make less mess you can just pour on the chocolate topping once the ice cream is frozen then slice into bars and serve. If eating with your hands it’s best to place on a small tab of greaseproof paper to use as a wrapper and avoid stickiness. Make raw using raw nut butter and coating in 1/3 cacao powder, 1/3 coconut oil / cacao butter and 1/3 sweetener such as date syrup. This was made using an 84% dark chocolate and with all the other sweetness from the maple and cashews the bitter dark chocolate shell tastes great. Mix together 2 tbsp of maple with the nut butter and spread onto a pan that’s about 15cm². It’s best to use a flexible pan or a normal pan with a non-stick sheet. If you are using tinned coconut milk, shake it and mix so all the coconut cream is evenly distributed. Add the cashews, coconut milk, 4 tbsp of maple and the vanilla to a high-speed blender and whizz until all is combined. You may need to add a few tbsp of water to help the blender make it smooth. Pour the vanilla ice cream over the pan that has the nut butter spread out. Place in the freezer for about 3 hours. remove when frozen but still soft enough to slide a knife through. Tip out of the pan and it should be soft enough to cut, but hard enough to work with. Cut in half, then cut each of these into three so you have 6 snickers ice cream bars. Chop up the chocolate and melt using bowl in another container with warm water (double boiler / bain-marie). Using a fork hold each bar over the melted chocolate and spoon on enough chocolate to cover. Sprinkle with chopped nuts and then place on non stick paper and return to the freezer for half an hour. They will be ready to eat or you can store in the freezer for a few months. Take out of the freezer for 20-30 mins before eating (if left there more than a few hours after coated in chocolate) to soften up. 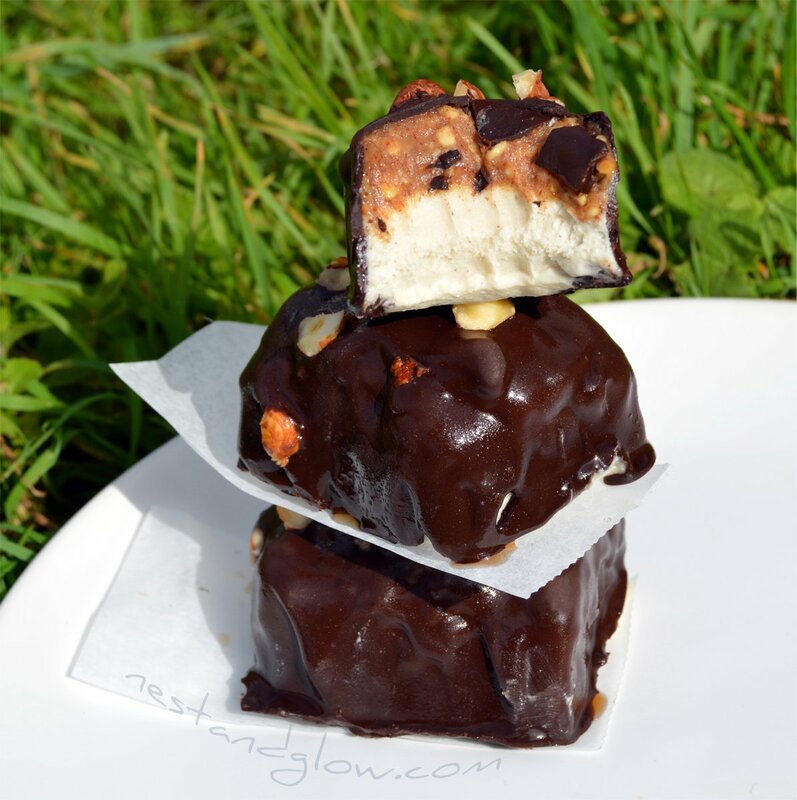 If you like this recipe check out our Salted Caramel Snickers Recipe. Hi, when you say 360 cal is that in one of the six bars? Or all six! Your recipes are amazing btw! Thanks for your kind words. It’s for one bar :), high I know but it’s from all the plant fats so they are good calories full of nutrition (especially if you use very dark chocolate). The good thing is that one bar does satisfy you way more than junk food, so I find I’m less likely to overeat.